For all the coffee drinkers and aficionados who despise the long café lines, dread the overwhelming coffee options or need a fix for those early morning caffeine pains – fear no more! There’s finally an affordable, low-maintenance coffeemaker that can brew basic or premium-roast coffee in a fraction of the cost as the coffeehouse: The Two-Way Brewer. With stainless steel durability and twice the brewing options as other leading coffeemakers, the Two-Way Brewer doubles as a compact single-serve coffeemaker for everyday personal enjoyment and a full 12-cup pot machine. Whether it’s 7:00 AM or a late-night indulgence, this two-for-the-price-of-one coffeemaker lets coffee drinkers decide the right size to start their day and enjoy the best convenience for their schedule. If simplifying your morning wake-up routine is a top priority, then rise and shine with the “single-serve side” which can brew a standard-size cup or travel mug-size cup for solo enjoyment. If entertaining or serving more than one coffee drinker is your preference, simply switch to the “carafe side” and let the Two-Way Brewer make a full 12-cup pot. So much in so little space, the Two-Way Brewer provides twice the brewing options using less space on your countertop than two separate coffee machines. Want to sleep in for five more minutes? Go ahead, get some more beauty sleep and take advantage of the built-in, programmable clock and timer. 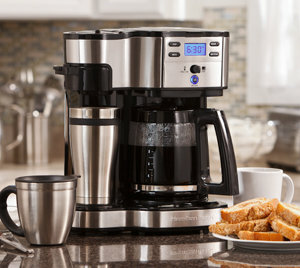 Its hour and minute features let you program your ideal coffee-drinking time up to 24 hours in advance. No time for measuring or scooping? Prefer the convenience of quickly dropping in a pre-packaged, pre-flavored pod? The Two-Way Brewer is designed with a pod holder that brews any brand of soft pod coffee and still gives coffee drinkers the complete sensory experience of tasting freshly ground coffee, without the hassle of messy grinds or exact measuring. For coffee lovers who live for the pleasure of roasting their own beans every day, this Two-Way Brewer offers an added bonus for the extra effort. Equipped with a Brew Strength Selector, you can you choose REGULAR and give your tastebuds the simplicity of standard medium-grind coffee, or you can go BOLD and select a decaf, finer grind or a premium roast brand, such as Starbucks or Melitta for richer flavor. Did you know that there are four factors that can dramatically reduce a coffee’s freshness? Oxygen, moisture, heat and light. Keep in mind that because less of its surface area is exposed to air, whole bean coffee typically stays fresh longer than ground coffee. According to the National Coffee Association of USA, it’s recommended that brewers should ration out individual amounts of coffee to grind and brew every time, to preserve its freshness and ensure better-tasting coffee. *Source: 2010, National Coffee Association, USA, Inc. Remember, the Two-Way Brewer unit will only brew one side at a time. For a particular preference, simply switch the lever left or right. The unit can be used with any soft pod coffee brand, available in the coffee aisle of your local grocery store, or with any loose coffee grounds. The Two-Way Brewer is not compatible with the K-Cup pack. When in doubt about freshness, look for a “use by” date on the package or follow the online recommendations of your coffee brand. To avoid overflow of ground coffee, use slightly less coffee when brewing decaf or flavored brands. For hotter coffee: rinse the travel mug with warm water; then replace with travel mug lid and brew directly into the travel mug with lid in place. Remember, adding cold milk or cream to your coffee can affect the heat. First, warm milk or cream before adding to ensure the hottest cup.